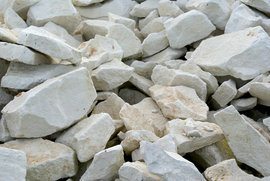 Crushed limestone is commonly used as a building material, it is also part of cement, and it can be used as facing stone or flooring tile. For a fireplace surround, limestone usually costs less than granite or marble, and it is easier to cut, which may also save on installation costs. It is, however, more easily damaged, and therefore should not be used with wood-burning fireplaces.